In fact, United Airlines had a bad week when it came to flying with dogs. The day after Kokito’s death, Irgo, a 10-year-old German Shepherd Dog who was moving from Oregon to Kansas with his family, was mistakenly put on a flight to Japan. Irgo is okay, and United flew him back to his family on a private jet, but it’s terrifying that the dog was lost in the first place and ended up in another country before anyone at the airline realized what had happened. Then, a few days later, a flight from Newark to St. Louis made an unscheduled landing in Ohio, because a dog was put onto the plane by mistake and was headed to a wrong destination. So, what should dog parents know about flying with a dog? How can you keep your dog safe if you choose to or must fly with your dog? Let’s review some safety guidelines and what to know about flying with a dog. Flying With a Dog — First, Why Do People Fly With Their Dogs? Flying with a dog doesn’t have to be dangerous. Photography featuring SHERPA® Original Deluxe carrier, part of the Guaranteed On-Board® program. Photography courtesy sherpapet.com. In our global world, pet owners increasingly want to travel with their pets — on land and in the air. In fact, 1 million animals are transported by airplanes every year. In some ways, flying with a dog is safe, and the Animal Welfare Act provides some guidelines intended to keep animals safe on airplanes, including how old they have to be, how long they can be left waiting before boarding, etc. Head to transportation.gov to learn more about the specific regulations for flying with a dog. But flying with a dog isn’t always dangerous. Some people do it regularly, for example, people who fly their large dogs in cargo to agility (and other dog sport and show) competitions domestically and internationally. People in the military also fly with their dogs when relocating to military bases around the world. When my partner and I moved from Portland, Oregon, to New York, New York, 11 years ago we flew our (at the time only small) pets in the cabin of an airplane. There are lots of reasons that might necessitate flying with a dog, so here are some expert tips and suggestions for how and when it can be done safely. If you’re looking at flying with a dog, there are some breed-specific concerns to keep in mind. “In summer months, many airlines won’t allow brachycephalic breeds to fly, those being French Bulldogs, Pugs and Bulldogs, because their anatomy can result in breathing complications, which are worse in summer months,” says Emmy-award winning veterinarian, Dr. Jeff Werber. Your dog’s age should also be factored into the decision. “Older dogs might be restricted. For any age dog, make sure your dog is checked by a veterinarian to make sure she is healthy enough to fly,” says Dr. Werber. When flying with a dog, you can’t ever be too prepared. 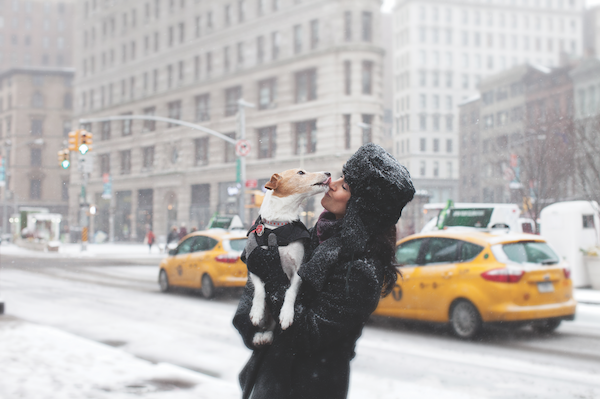 Ensure you have the appropriate carrier before you travel with your dog. Photography featuring SHERPA® Original Deluxe carrier, part of the Guaranteed On-Board® program. Photography courtesy sherpapet.com. Research airlines and find one with a track record for safely transporting dogs that you feel comfortable with. You can get a full overview of all incidents involving animals from the publicly released government reports. Want to avoid putting your large dog in cargo, or need to fly with multiple dogs? Look into chartering a private jet. Pet Travel will help you book a private flight for you and your dogs to anywhere in the world. Your dogs will fly with you in the cabin, so there are no worries like size or breed restrictions. Not quite ready to charter a jet? Another option is a pets-only airline like Pet Airways, which offers flights specifically catered to its “pawsengers.” All pets fly in the main cabin of the plane right behind the pilot with a pet flight attendant to look after them. Pet Airways even helps to transport dogs from shelters/rescues! 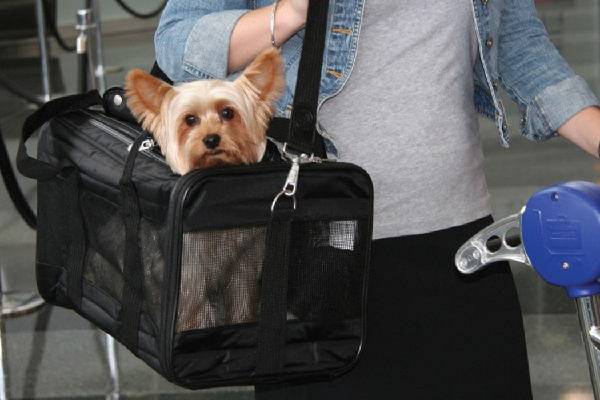 Purchase an airline-approved, soft-sided carrier if you are flying with a dog in the cabin. Buy the carrier well ahead of time to ensure that your dog can fit inside the carrier and has time to get acclimated to it. Even dogs who are crate-trained may need some time to get used to a soft-sided carrier. Check with your airline carrier about under-seat dimensions when booking your flight. Different airlines have slightly different specifications. Some airlines like Jet Blue sell their own carriers, which is an extra expense but one less thing to worry about the day of your trip since it ensures your carrier will be the right size. If your dog is flying cargo, discuss all details of the trip ahead of time with your veterinarian and your airline to determine what medical records need to be provided, and if your dog is healthy enough to travel in cargo. Purchase a crate that meets the requirements of the U.S. Department of Agriculture (USDA) and the International Air Transport Association (IATA) before the flight. This includes specifics about the size of the crate depending on the size of dog, what material the crate is made out of, etc. Have food and water bowls attached to the front of the crate in such a way that food and water can be provided by airline staff without having to open the crate. Have dry dog food attached to the top of the crate. Secure all connection points on the crate, too. Have your dog’s name, your name and your contact information clearly labeled on your dog’s crate prior to arriving at the airport. Dogs are not permitted to fly with toys in their crates. Once you’ve booked your flight, be sure to talk with your airline about exactly what will happen the day of your flight. If your dog is flying cargo, find out who will be interacting with your dog and how. “The cabin is safer, except in overhead bins, which can be lethal as a result of not enough oxygen, circulation, temperature control or panic,” Dr. Werber explains. Be an advocate and make sure all dogs arrive at their destinations safely. Photography by The Dog Photographer. If someone asks you to do something that feels dangerous or doesn’t seem right, don’t comply — your dog’s life could be at stake. If you see or hear someone being asked to do something that is dangerous or doesn’t seem right, be a good ally — stand up and support the dog parent. If even just one passenger had challenged the flight attendant’s request to move Kokito to an overhead bin, he might be alive today. In response to the death of Kokito, his mom, dog lovers and New York State Senator Marison Alcantara (D-Manhattan) conducted a “dog-in” at the LaGuardia Airport with their dogs to protest Kokito’s death. They unveiled ‘Kokito’s Law,’ a canine passenger bill of rights to honor the memory of the puppy. Tell us: What do you think about flying with a dog? Have you ever flown with your dog? What tips would you add? The post What to Know About Flying With a Dog — Safely appeared first on Dogster.